String methods are utilities that you can use to modify any given string. Here are some of the most useful ones, in my opinion. // Use .trim() to strip leading and trailing whitespace from a string. // Result: "Oh no! Leading AND trailing whitespace!!" // Use .replace() to replace characters or regular expressions with something else. // .replace() without a regular expression replaces the first instance. // Result: "mixed case string"
// Use .substring() to return only part of the string. Here we first identify the first letter of the string using a regular expression, after which we replace it with the first letter of the string that has been converted to upper case. So eachItem is the variable where the iterator stores each member of the Array as it is processed. If the callback returns true, it means that the item is added to the returned, new Array. If it returns false, it’s dropped. The iterator checks every single item for the property event, and returns true if that property has value addMe!. Thus the returned array only has those elements that have the key-value pair "event" : "addMe!". Remember the clumsy for-loop for iterating over an Array? Yuck! Instead, you can use the forEach() iterator. forEach() receives each item in the array one-by-one, and you can then do whatever you wish with this item. The syntax is very simple and intuitive, and thus should be preferred over the confusing for-loop. // Result: "I love you"
As you can see, it’s more readable than a for-loop, as you don’t have to access the original array in the iterator. The ternary operator is thus used to combine an if-statement into a simple expression. First you provide an expression that evaluates to a truthy or falsy value, such as me.name() === "Simo". Then you type the question mark, after which you write an expression that is executed if the first item evaluates to a truthy value. Finally, you type the colon :, after which you type the expression that is executed if the first item evaluates to a falsy value. The variable creates a GUID string (“Globally Unique Identifier”), and even though uniqueness isn’t guaranteed, it’s still very likely. There’s only a microscopically small chance of collision. This solution is gratefully adapted from this StackOverflow post. This is one of my favorite solutions, as it lets you convert the current client time to a proper, readable timestamp. In addition, it has the timezone offset included, so you’ll know just how much the users’ local times differ from your own timezone. I send this to Google Analytics with every single hit, so that I can create a timeline of events when analyzing the data. When working with the Document Object Model (DOM), being able to identify elements is crucial. We already have a bunch of wonderful CSS selectors at our disposal, but now we just need a method we can use to check if any given element matches one of these selectors. // RESULT: true or false, depending on if the parent element matches the selector. In Google Tag Manager, you’ll need a Custom HTML Tag that fires as early as possible in the container load sequence (i.e. All Pages trigger with a high tag priority). Here’s the code you need to add to the Custom HTML Tag. It’s gratefully adapted from this MDN reference page. NOTE! This relies on the matches() method, so don’t forget to implement the polyfill from above, first! Cookies are a great, if somewhat outdated, way of storing information in the browser. Since Google Tag Manager operates in the context of a web page, it is essentially stateless. Thus any information you want to persist from one page to another must be stored either in the server or the browser itself. 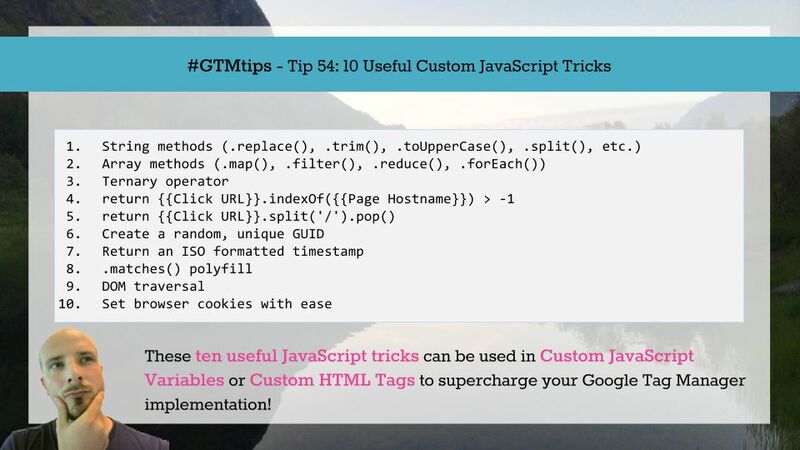 The latter is far easier to do, and with browser cookies it’s just a question of adding a couple of lines of code to your GTM deployment. ms: expiration time of the cookie in milliseconds. If unset, defaults to a Session cookie (expires when the browser is closed). path: the path of the cookie. If unset, defaults to the current page path. domain: the domain of the cookie. If unset, defaults to the current domain. The code above, when run in GTM, sets a cookie with name "test", value "true", expiration time of ten seconds, and it’s set on the root of the simoahava.com domain. With this helper, setting cookies is a breeze. Remember that you can then use the handy 1st Party Cookie variable in GTM to retrieve values from set cookies. Do you have any favorite methods, tips, or tricks you want to share? Please do so in the comments below.